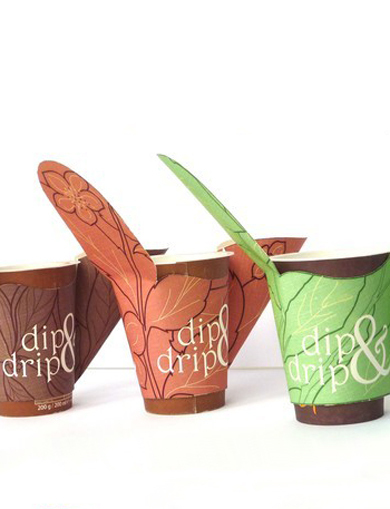 A strip of cardboard wraps around glasses, specifically designed to taste hot beverage such as tea, chocolate, herbal teas, etc. while in movement. As well as insulating from heat it can hold cookies and protect from dripping, thanks to an "anti-drip" tab that prevents staining when bringing it to the mouth, hence the name "Drip&Drop". A project for Salone Interazionale del Gusto 2010 (Turin, Italy).